Used to seeing Sharon Den Adel all glammed up and fronting some symphonic metal as part of leading lights in the field, Within Temptation? Make way for something a little more off the beaten track. 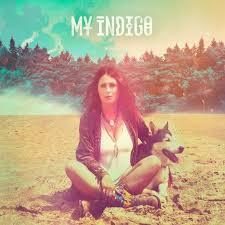 The cover of My Indigo provides a clue. No flowing gowns, candles and grandiose settings, but a sign in the dressed down fashioning and dusty ambience that this is a ‘back to nature’ record. Two years of retreat, healing and exploration; a withdrawal from the limelight, stresses and strains of international touring to find sanctuary in solitude and an outlet for a different musical direction. The songs may not have fallen too far from the tree although in a different way; lyrically more intimate, more personal and not surprisingly, a result of her current life experiences channelling themselves into her music. Almost an outpouring, what some would call cathartic, and a chance to help support an emotional recovery. A change from the usual empowering and uplifting arrangements her band make their own, into something more vulnerable and introspective. The title track opens with exactly what the album is about, the signature and unmistakable Den Adel emotional vocal dominating a sparse soundscape before indulging in some electronic moods that could easily form the roots of something much bigger given the presence of a guitar or two. And although there’s less of the metallic leanings associated with WT, My Indigo is far from being stripped back to the bone. The arrangements encompass a Euro glossiness that’s glazed with contemporary pop – listen to Black Velvet Sun which is pure club anthem – and her love of eighties music with a core of keyboard moods and electronics. Indian Summer dips into a reggae influenced rhythm while there’s something more familiar in the piano led Out Of The Darkness and Lesson Learned. Almost inevitably, most of the arrangements build into grander gestures with the big production saved for Where Is My Love and with Within Temptation producer Daniel Gibson at the helm, the pair have kept things safely within the comfort zone. What doesn’t kill you makes you more strong. Sharon Den Adel has used My Indigo as part of her healing process and revealed a hidden, vulnerable and meditative side that flies below the Within Temptation power and bravado.